Today's transportation professionals, with limited resources available to them, are challenged to meet the mobility needs of an increasing population. At many highway junctions, congestion continues to worsen, and drivers, pedestrians, and bicyclists experience increasing delays and heightened exposure to risk. Today's traffic volumes and travel demands often lead to safety problems that are too complex for conventional intersection designs to properly handle. Consequently, more engineers are considering various innovative treatments as they seek solutions to these complex problems. The corresponding technical report, Alternative Intersections/Interchanges: Informational Report (AIIR) (FHWA-HRT-09-060), covers four intersection designs and two interchange designs that offer substantial advantages over conventional at-grade intersections and grade-separated diamond interchanges. The AIIR provides information on each alternative treatment covering salient geometric design features, operational and safety issues, access management, costs, construction sequencing, environmental benefits, and applicability. This TechBrief summarizes information on one of these alternative intersection designs—the median U-turn (MUT) intersection (see figure 1). MUT intersections can be implemented as either full MUTs—where direct left turns from both the major and minor approaches are eliminated from the main intersection—or as partial MUTs—where direct left turns from only the major approaches are eliminated. On the major road, left turns are eliminated by requiring drivers to first travel straight through the at-grade main intersection and then execute their left turns by making U-turns at the median opening downstream of the intersection. They then must turn right when they reach the cross street. On the minor street, drivers who want to turn left onto the major road must turn right at the main intersection, execute a U-turn at a downstream median opening, and proceed straight through the main intersection. Figure 2 shows the geometric design of a full MUT, while figure 3 and figure 4 show the left-turn movements from major and minor roads for this design. Figure 2. Illustration. Typical MUT intersection view with crossovers on mainline approaches. MUT intersections have been widely used in Michigan, particularly in the Detroit metropolitan area where many roadways were constructed with wide medians on wide right-of-ways. Partial implementations (keeping the cross street left turns at the main intersection) with similar concepts have appeared in Florida, New Mexico, and Louisiana. The MUT intersection typically is considered a part of a corridor treatment. The elimination of left-turning traffic from the main intersection as well as left-turn signal phases results in both operational and safety improvements for the MUT intersection design. One-way crossovers are placed in the median to accommodate left turns from the major road to the side streets and left turns from the minor road. Median width requirements of 40 to 70 ft are necessary to accommodate large trucks. Where medians are narrower, MUT intersections can still be constructed; however, loons must be added to accommodate truck turns. Crossovers (and loons if needed) for U-turns may be one lane or two lanes wide depending on U-turn and opposing traffic volumes and the number of receiving lanes. Turn bays leading into U-turn crossovers are typically at least 250 ft long to provide for adequate deceleration and storage. As a safety measure, driveways should generally be prohibited in close proximity to the main intersection and also on the opposite side of the arterial from a median U-turn crossover to prevent wrong-way movements in the crossovers. Pedestrian crosswalk locations at an MUT intersection are unchanged from where they would be at comparable conventional intersections; however, in an MUT intersection, pedestrians are exposed to fewer conflicts with vehicles and therefore are expected to be safer. 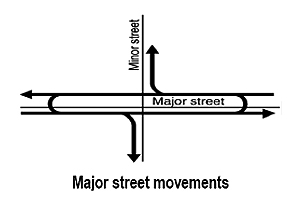 The major street crossing can be made in one or two stages. The main intersection in an MUT intersection design is almost always signalized. A few unsignalized MUT intersections exist in Michigan, but these are limited to intersections with low volume cross streets. The crossover at an MUT intersection may or may not be signalized. Agencies should use standard signal warrants and/or guidelines for protected left turns in making the decision about whether to install signal control at the crossovers. 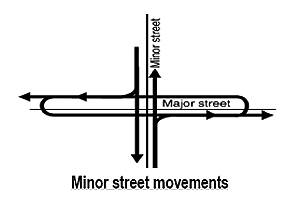 The signals at the main intersection and the crossovers in an MUT intersection design have only two signal phases because direct left-turning traffic at the main intersection is redirected to a U-turn. Much of the efficiency gained from installing MUT intersections stems from the two-phase signal operation. The traffic simulation software VISSIM was used to compare the operational performance of the MUT intersection to a conventional intersection. Two geometric cases were simulated under six sets of traffic volumes. The reduction in signal phases at the MUT intersection provided increases in vehicle throughput ranging from 20 to 50 percent over the conventional intersection. While there is additional travel distance for those making left turns at an MUT intersection compared to a conventional intersection, the total network travel time savings at the MUT intersection usually outweighs the travel time from the additional distance traveled. An MUT intersection has 16 conflict points compared to 32 in a conventional intersection. Studies performed by the MDOT and the University of Michigan show that total crash reductions ranging from 20 to 50 percent can be expected with this level of conflict reduction. (3–5) Moreover, head-on and angle crashes that have high probabilities of injury are lower for MUT intersections compared to conventional intersections. Candidate corridors for MUTs are medium to high speed four-lane divided highways. In rural areas, MUTs may be installed to address existing operational and safety needs and also anticipated needs when it is clear that the area may be developed into a more suburban setting. In existing suburban (and urban) settings, MUTs will result in immediate benefits in safety and operations, especially for through travelers on the major and minor streets. Locations where heavy side street through volumes, relatively low to medium side street left-turn volumes, and moderate to heavy left-turn volumes from the major road exist. 40 ft, locations where loons can be installed to accommodate large truck movements. The minor road total volume to the total intersection volume ratio is typically less than or equal to 0.25. Highway agencies may decide that an MUT intersection is not applicable if left-turn efficiency is a problem or if right-of-way availability is limited. A full MUT intersection reroutes both major street and minor street left-turning vehicles through one-way median openings located several hundred feet from the main intersection. This eliminates all left turns from the main intersection, reducing conflict points. It also allows two-phase signal controls at the intersection and the signalized U-turn crossovers. The benefits of the MUT intersection include increased capacity and safety. More details can be found in the full AIIR report available from the Federal Highway Administration. American Association of State Highway and Transportation Officials. (2004). A Policy on Geometric Design of Highways and Streets, Washington, DC. Jagannathan, R. (2007). Synthesis of the Median U-Turn Intersection Treatment, Safety, and Operational Benefits, FHWA-HRT-07-033, Federal Highway Administration, Washington, DC. Maki, R.E. (1992). Directional Crossovers: Michigan's Preferred Left-Turn Strategy, Michigan Department of Transportation, Lansing, MI. Scheuer, M. and Kunde, K.L. (1996). Evaluation of Grand River Avenue (M-5/M-102) Safety Improvement Project Before and After Study, Michigan Department of Transportation, Lansing, MI. Castronovo, S., Dorothy, P.W., Scheuer, M.C., and Maleck, T.L. (1995). 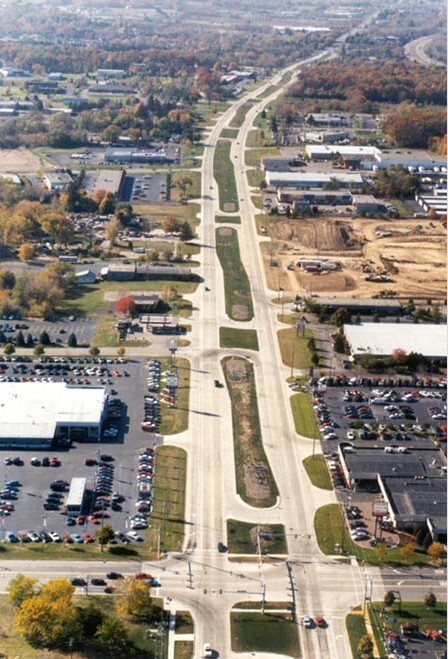 The Operational and Safety Aspects of the Michigan Design for Divided Highways, Vol. I, Michigan State University College of Engineering, East Lansing, MI. Availability—This TechBrief may be obtained from the FHWA Product Distribution Center by e-mail to report.center@dot.gov, fax to (814) 239-2156, phone to (814) 239-1160, or online at https://www.fhwa.dot.gov/research/tfhrc/programs/safety/. Key Words—Median U-turn, Alternative intersection, median U-turn intersection treatment (MUTIT), and MUT.